When shopping at the local Home Depot over the weekend, I discovered a section that's not found in Midwestern home improvement stores. 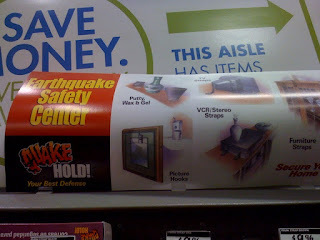 Yep - the "Earthquake Safety Center". Consisting of primarily straps to keep your furniture and electronics in place during a seismic event. I've felt a couple of small tremors here, it's quite exciting and odd all at the same time. Thankfully San Diego County isn't known for devastating quakes like L.A. or the Bay Area. Or St. Louis, where a several 8.0+ magnitude earthquakes in 1811-1812 caused severe damage to the lightly-inhabited land. 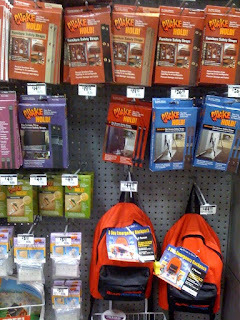 Maybe the Midwest Home Depots should dedicate an end cap to the same wares.